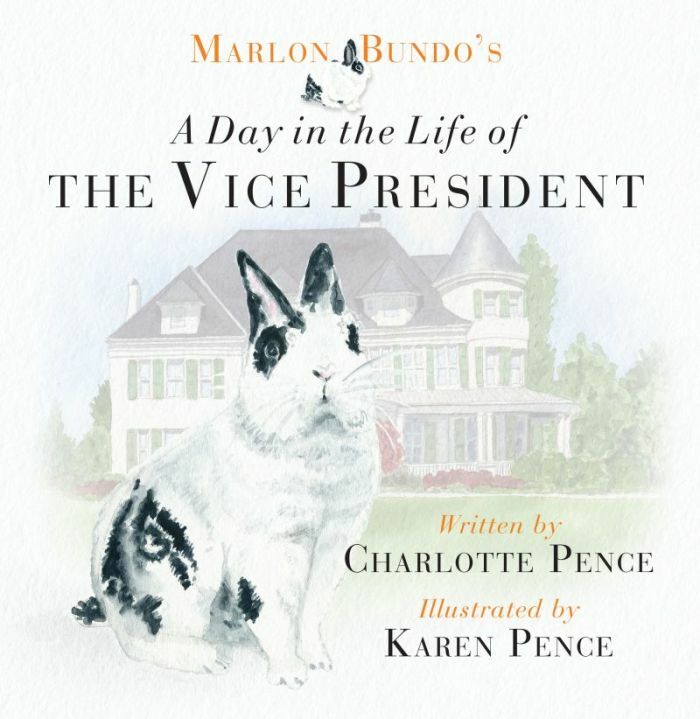 A new children's book by second lady Karen Pence and her daughter, Charlotte, details a day in the life of the vice president told from the perspective of their pet rabbit, Marlon Bundo. "The book shows the personal side of my dad," author Charlotte Pence said Tuesday in a phone interview with The Christian Post about her book, Marlon Bundo's A Day in the Life of the Vice President, along with her mother Karen, a watercolorist who did the illustrations. Proceeds from sales will benefit anti-human trafficking efforts and art therapy initiatives Mrs. Pence has long championed. The 24-year-old daughter of Vice President Mike Pence resides in Los Angeles and is pursuing a career in filmmaking. The idea for this new book all began with her rabbit's growing online presence, she explained; her 5-year-old bunny has an Instagram account with a following of over 21,000. Marlon Bundo made his first appearance with his own account on the online picture sharing social media platform shortly after her father's and President Trump's inauguration in 2017. She first acquired the rabbit for a college film project and he has since been dubbed "BOTUS" — Bunny of the United States — and is the main character in the story. The Pences thought it would be fun to write a historic and educational book for children about the vice presidency. The book showcases several dimensions of the second-most powerful political office in the United States, including the role the vice president has as president of the Senate. The Pences also provide a look inside the Naval Observatory in Washington D.C., the official residence of the vice president. The storyline traces Marlon Bundo as he hops from place to place, following Vice President Pence around for a day, a feat that, obviously, can't actually happen in real life. At the end of the book, Marlon Bundo is seen with the vice president, who was raised Roman Catholic and is now a devout evangelical Christian, reading the Bible and praying before bed. "My dad reads the Bible every day, prays every day, and we just thought that would be really fun and really special to put that in," Charlotte said. Readers will notice that the page of the Bible the vice president is poring over is the 29th Chapter of the book of Jeremiah. "The verse Jeremiah 29:11 is very special to my family. We have a painting of it on our mantle," she said. That passage reads in the English Standard Version: "For I know the plans I have for you, declares the Lord, plans for welfare and not for evil, to give you a hope and future and hope." "I really think we were kind of surprised that anybody even wanted to represent us," Mrs. Pence said when asked how this project bolstered their faith. "We thought this was a great idea, but frequently book agents don't necessarily think that ... And now we're actually on the book tour, holding the book in our hand, and sharing it with people all over the country. It's just really special to see how God took us from the very beginning and brought this whole project to fruition." Not everyone has received their project warmly, but it does not appear to bother the Pence family. "Last Week Tonight" host John Oliver presented his own book, a parody, which features the Pences' rabbit in a very different story, one where Marlon Bundo and another male rabbit fall in love but run into opposition to their relationship upon encountering a grouchy "stink bug" character sporting a white top that resembles Vice President Pence's hair. The stink bug reportedly refuses to let the two male bunnies get married. "Honestly, you know, the book is just a fun book about a bunny and Marlon is a real bunny. And I know that John Oliver's book is raising money for charity," Charlotte said of the matter. "So I think we can just have fun with it," she added light-heartedly, noting a good-humored post on Marlon's Instagram account responding to Oliver's program. A portion of the proceeds from sales of the Pence's book will benefit A21, a nonprofit organization Australian evangelist and author Christine Caine founded to combat the scourge of human trafficking. "I just love their organization," Charlotte said of A21. She has been involved with the group for a while, did a fundraiser for them on her Instagram account on her birthday last year, and has personally met the Caines and their team. "They spread awareness about human trafficking so people can report it, fight human trafficking, and they help survivors. They're all over the world and I just wanted shine a light on what they're doing." she explained, praising their work. Charlotte Pence also highlights in the book aspects about the vice presidency that she didn't know about until her father assumed office, including that he has a ceremonial office in the Eisenhower executive office building next to the White House, and that the Naval Observatory where her family now lives has a functioning observatory equipped with a telescope to view the stars. The two members of the second family say they are having a great time on the book tour, which includes national television appearances on Fox News and ABC's "The View," and visits to military bases around the country. Proceeds from the book's sales will also benefit art therapy initiatives at Riley Children's Hospital and the charity Tracy's Kids. Mrs. Pence has been passionate about art therapy for many years and serves on the board of both organizations. 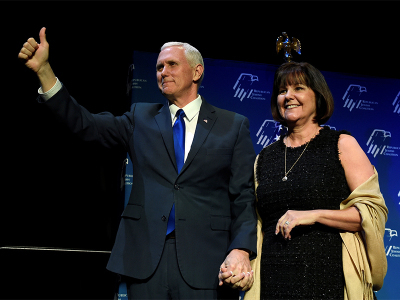 "I just knew they could use a little boost from our proceeds," Mrs. Pence said. "It was really a lot of fun to collaborate with Charlotte," she made a point to say. "She has worked her whole life to become an author and filmmaker, and so to be able to work with her on her very first published book is really a very sweet experience for a mom. And I'm just so proud of her and so grateful that she let me come along for the ride."